This CEU program consists of 3 streaming videos. Presented by Barbara Hypes, P.T. Using the Therapy Ball to Treat the Pediatric Patient guides the viewer through the use of the therapy ball with various patients and disability types. Components of control such as ROM, mobility, synergistic motor control, alignment and motor planning are discussed and demonstrated. Presented by Barabara Hypes, P.T. 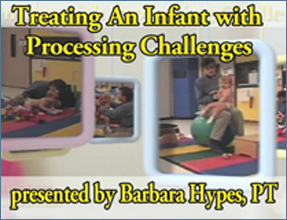 Treating a 1 Year Old Who Presents with Processing Challenges presents characteristics of processing issues and intervention concepts designed to help the child integrate sensorimotor processess. Presented by Regi Boehme, OTR. Gaining Control of the Trunk: Treatment of a Young Child with Spasticity, Gaining Trunk Control in a Child with Spasticity demonstrates aspects of physical handling assessment and treatment for a child with spasticity. Emphasis is placed on improving trunk function, weight bearing over the hips, and organizing head movements. 1. Describe the potential benefits of using a therapy ball in treatment. 2. Describe the differences between sensory processing problems and typical hypotonia. 3. Describe some basic treatment techniques used for children with spasticity. High Speed Internet Connection Required. Wireless connections may not be consistently fast enough to watch long video files. You may need to have your computer connected directly to your high speed modem via an internet cable. For special needs requests please contact us by phone or email. contactus@clinicians-view.com Phone 575-526-0012. Fax 575-526-0014.